Is your team ready for ICD-10? Update 9/30/2015: We're in the home stretch. If you need last-minute in-depth information about the ICD/DSM transition, register to view our webinar or contact eHana directly. October 1st, 2015 is arriving quickly. That's the date when the Center for Medicare & Medicaid Services (CMS) has mandated that healthcare providers and payers switch over to the new ICD-10 coding system. In addition, behavioral health providers will generally be required to switch to DSM-5, the newer version of the DSM-IV-TR diagnosing standard that has been in use for over a decade and a half. To begin with -- what is the ICD-10, and how does it differ from the ICD-9 codes we're currently using? Because of the dramatically expanded number of codes, there are some hilarious examples of codes. The example above is the code for "Struck by Orca", which is available in a humorous book of the same name from ICD10Illustrated.com. The good news, as it pertains to behavioral health providers at least, is that the "F" codes used by providers, tends to be much simpler than the broader set of ICD-10 codes. The DSM-5 also represents a substantial change, both on a structural level (no more "Axes") and from a content perspective. Among other changes, in the DSM-5, disorders have been added, category names revised or eliminated, disorders have been re-categorized, the criteria has been changed for many existing disorders, and specifiers and severity indicators have been added. One of the biggest transition questions agencies face is how to map from the ICD-9 to the ICD-10. There are many different types of mappings. 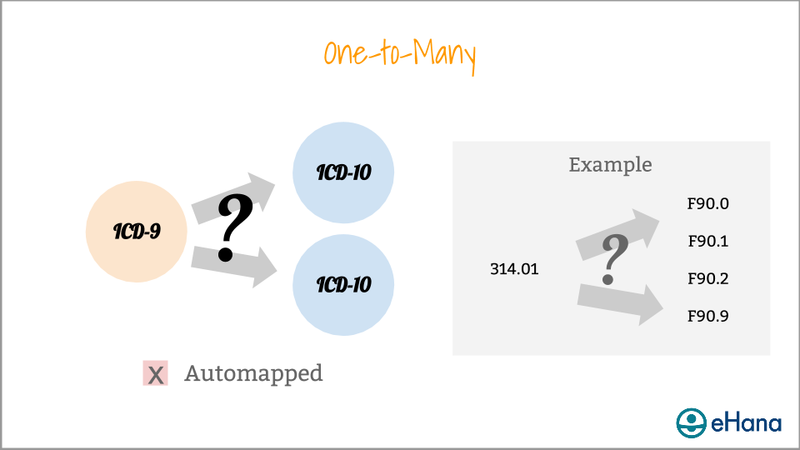 The type of mapping available for a given code determines the ease at which a diagnosis can be translated from ICD-9 to ICD-10. In our (eHana's) experience, the typical behavioral health provider can expect to automatically map about 50% of its active billing diagnoses. The impact of the ICD-10 and DSM-5 transition is widespread, with effects throughout a typical provider organization. Billing is at risk based on staff, EHR, billing system, or payer readiness; operational processes will be reassessed around new code categories; and documentation and delivery of clinical care, as well as quality assurance, are impacted. For more detailed planning information, watch eHana's ICD-10 & DSM-5 Transition Webinar. eHana EHR is 100% ready to support your agency's transition to ICD-10 and DSM-5. Because of our web-based "Software as a Service" approach, the new codes were rolled out, and the existing clients automatically mapped where possible, without any workflow interruption or new software to install. We're here to help. The eHana team has over 15 years of experience in helping agencies manage regulatory changes. Earlier this year, we conducted a webinar covering the ICD-10 and DSM-5 transition, which we encourage you to view. Click here to register to view the webinar.